Today’s Throwback Thursday was released in honor of OPI’s 20th anniversary as part of the 12-shade World collection from Fall 2001. I have several favorites from that collection (Black Tie Optional, Int’l Date Line, Mat-Adore Red, Outback Aphrodisiac, and 20 Candles on My Cake) but this one is the best of the bunch, for me. Russian to a Party (NL W30)—that’s a great name, isn’t it? !— is a deep and lush red with elegant brown undertones and swirls of antique gold shimmer. Now, red shimmers are a dime a dozen, but I think this is a particularly nice one. It’s deep yet not vampy. The old gold shimmer is unusual and though it’s very obvious in the bottle, it is subtle and exceedingly elegant on the nail. It might lean a little too brown for some, but on my warm-toned skin, I’m a big fan of this color. Because this is an older OPI, I suspect I’ve added thinner to it at some point. I used three thin coats in my swatch, though two was fine—it’s just richer-looking with three. Either way, it still applies smoothly. The chemical stink is pretty strong, though again, that could also be the thinner. The finish remains quite smooth and glossy. 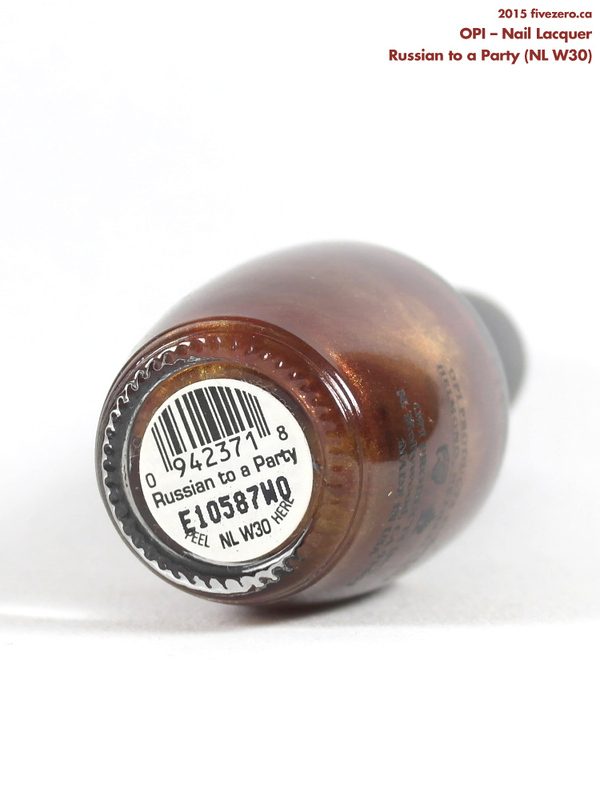 Russian to a Party is long discontinued, but if you do happen to unearth it in a dusty nail salon, by all means get it! It’s not exactly a must have, since there are plenty of available colors that are similar (though perhaps not exactly the same). 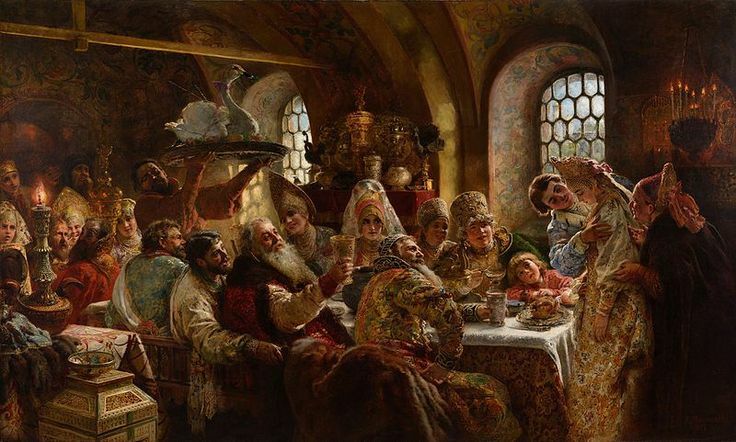 Still, it’s quite gorgeous and it’d be a shame to pass on a polish this lovely. 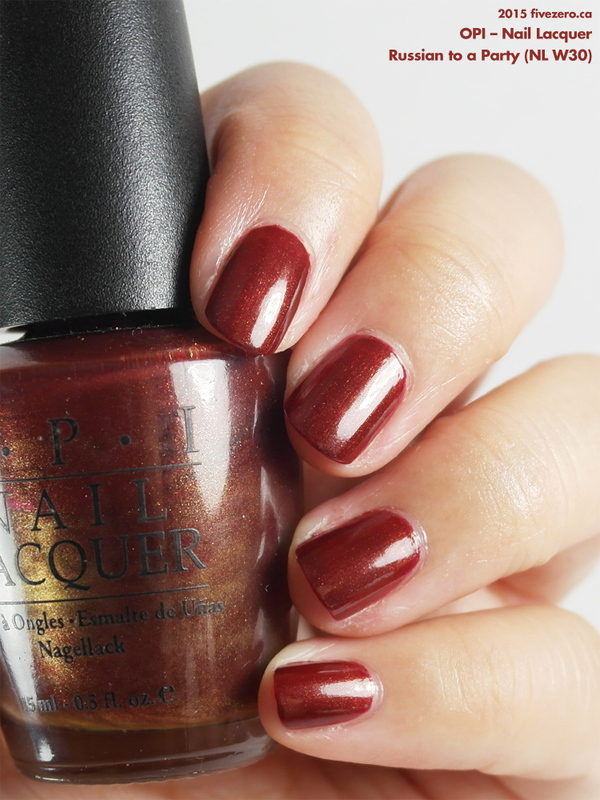 OPI Nail Lacquer retails for about US$9.50 / CA$12 and is 0.5 US fl oz / 15 mL. OPI nail polishes are currently free of toluene, formaldehyde, dibutyl phthalate (DBP) and camphor. (Since this polish is pre-2007’s reformulation, it is not 3-Free.) They are made in the USA. Defiintely! I really have to start pulling out more of these luxe shades. What a beautiful shade! I always love OPI’s color names too. Haha! Gorgeously toned golden speckled red and more beautifying statement here is its name. What a glam filled name! I used to have this shade and I loved it.